Keeping global warming to within 1.5-2°C may be more difficult than previously assessed, according to a study in Proceedings of the National Academy of Sciences (PNAS). A "Hothouse Earth" climate will in the long term stabilize at a global average of 4-5°C higher than pre-industrial temperatures with sea level 10-60 m higher than today, says the paper. The authors conclude it is now urgent to greatly accelerate the transition towards an emission-free world economy. "Human emissions of greenhouse gas are not the sole determinant of temperature on Earth. Our study suggests that human-induced global warming of 2°C may trigger other Earth system processes, often called 'feedbacks', that can drive further warming – even if we stop emitting greenhouse gases," says lead author Will Steffen from the Australian National University and Stockholm Resilience Centre. "Avoiding this scenario requires a redirection of human actions from exploitation to stewardship of the Earth system," he adds. The authors of the study consider ten natural feedback processes, some of which are "tipping elements" that lead to abrupt change if a critical threshold is crossed. These feedbacks could turn from being a "friend" that stores carbon to a "foe" that emits it uncontrollably in a warmer world. These feedbacks are: permafrost thaw, loss of methane hydrates from the ocean floor, weakening land and ocean carbon sinks, increasing bacterial respiration in the oceans, Amazon rainforest dieback, boreal forest dieback, reduction of northern hemisphere snow cover, loss of Arctic summer sea ice, and reduction of Antarctic sea ice and polar ice sheets. "These tipping elements can potentially act like a row of dominoes. Once one is pushed over, it pushes Earth towards another. It may be very difficult or impossible to stop the whole row of dominoes from tumbling over. Places on Earth will become uninhabitable if 'Hothouse Earth' becomes the reality," adds co-author Johan Rockström, Executive Director of the Stockholm Resilience Centre and incoming co-Director of the Potsdam Institute for Climate Impact Research. "We show how industrial-age greenhouse gas emissions force our climate, and ultimately the Earth system, out of balance. In particular, we address tipping elements in the planetary machinery that might, once a certain stress level has been passed, one by one change fundamentally, rapidly, and perhaps irreversibly. This cascade of events may tip the entire Earth system into a new mode of operation," says co-author Hans Joachim Schellnhuber, Director of the Potsdam Institute for Climate Impact Research. "What we do not know yet is whether the climate system can be safely 'parked' near 2°C above preindustrial levels, as the Paris Agreement envisages. Or if it will, once pushed so far, slip down the slope towards a hothouse planet. Research must assess this risk as soon as possible." Maximizing the chances of avoiding a "Hothouse Earth" requires not only reduction of carbon dioxide and other greenhouse gas emissions but also enhancement and/or creation of new biological carbon stores, for example, through improved forest, agricultural and soil management; biodiversity conservation; and technologies that remove carbon dioxide from the atmosphere and store it underground, the paper says. 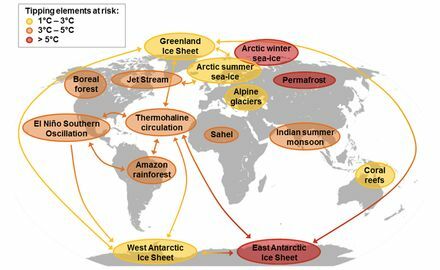 The study emphasizes that these measures must be underpinned by fundamental societal changes that are required to maintain a "Stabilized Earth" where temperatures are ~2°C warmer that the pre-industrial.